I have now read every single one of Julie Klassen’s books. 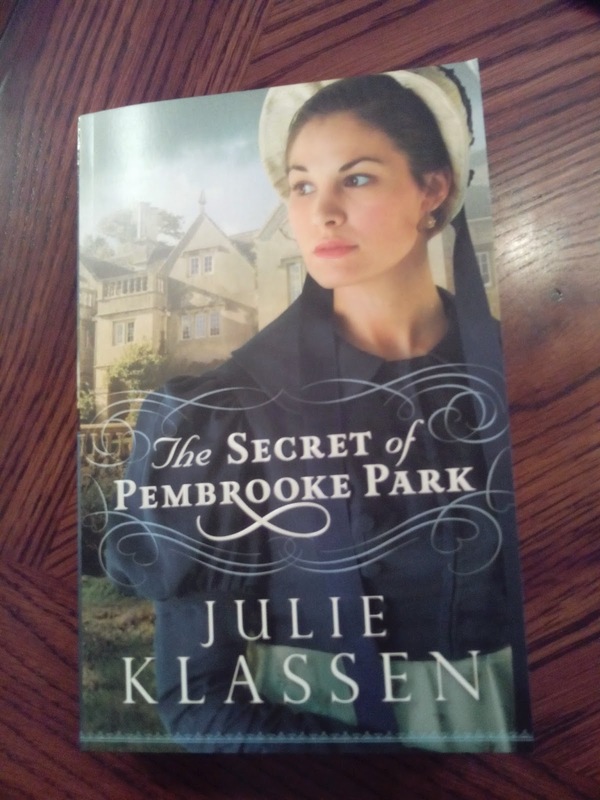 On her About Page on Goodreads is this description – “Julie Klassen loves all things Jane—Jane Eyre and Jane Austen.” Yes! I can tell! So when I received an email from Bethany House that Klassen’s latest book is available for review, I snatched it up and was not disappointed. I started reading this book and could barely put it down. It’s longer than most Christian historical fiction, coming in at 456 pages. Even being a longer book, I felt there wasn’t much filler. The story was great, about a “spinster” whose family loses their fortune so they must move into the country. They move into an abandoned house, one filled with the servants’ whispers of tragic events that happened years ago. The rumor is that there is a treasure hidden somewhere in the house. Is the rumor true? Is Abigail going to be a spinster or will she marry? Parts of the book were cheesy, mainly Abigail’s romantic interludes. But the treasure hunting aspect of the story and how Abigail seeks to uncover her home’s past, were delightful. While I can’t label this a classic that I’ll be returning to, Klassen wrote another fantastic weekend read. I just discovered that she has another book scheduled to come out next summer and I can’t wait! On a complete whim, I decided to enter the drawing for the new book Petticoat Detective. I’m not very familiar with the author but thought that the premise sounded interesting enough, a woman detective who goes undercover as a lady companion. Hopefully it’s good! I’m just excited I won a free book. I recently finished reading Washington’s Lady (Nancy Moser) and was really struck with how applicable one of the thoughts was. “All things – fine or not – belonged to the Lord, and if He should choose to take them all away from us, I would grieve (and ponder why) but finally accept His will as superior to our own. George and I both believed the Almighty had His reasons for all things. We relished the occasion when He let us in on the secret” (pg 117). Today we received the final refund check from the failed adoption attempt. I can finally close that door and face the future. I’m sure I will continue to miss the girl we thought was going to be our daughter. But I want to start looking forward and concentrate on the girl we’re trying to adopt now. I still don’t know why God closed the door on our previous adoption but I will have to trust in Him. And maybe someday He will let us in on the secret. Book review – with a giveaway! 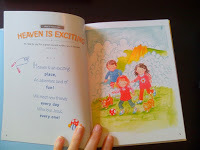 I’m so excited that I get to post a book review that includes a giveaway! Adams Group contacted me about reviewing the book Life Not Typical: How Special Needs Parenting Changed My Faith and My Song by Jennifer Shaw. When I read the description, I knew this was a book I needed to read. Life Not Typical is a memoir about a parent who discovers that her son Toby has Sensory Processing Disorder (SPD). Toby refused to walk on grass, screamed when he got wet, and hated the wind. Even though people told her that he would grow out of it, Jennifer fought to figure out exactly what was going on with her son. When he was diagnosed with SPD, he was able to get the therapy he needed and his life was changed. Jennifer and I are different in that Toby is her biological son and we are adopting internationally. However, I still felt this book would be extremely beneficial to read. In international adoption, SPD is rarely diagnosed and listed in a child’s adoption file but is often diagnosed after the children come home. I have read blog posts where parents talk about their children having SPD but didn’t know much about it until I read Life Not Typical. The book does deliver on both aspects of the subtitle. It talks about special needs parenting, what it’s like to have a child who is challenged with sensory issues, how therapy worked for their family, and about how Toby was able to improve over time. Jennifer also talks about her music ministry, how God worked through both her music and her parenting to increase her faith in His guidance and care. I thought the book was a great overview of both SPD and how God builds our faith through life’s trials. I do wish the book was longer, that it had covered both topics in more depth, but I thought it was a great overview. Adams Group is offering a copy of the book to someone who reads my blog. Just leave me a comment and I will draw a winner on Tuesday (Nov. 11). Please make sure I have a way to contact you. I hope you enjoy the book as much as I did! When I saw this book mentioned in a newsletter, I knew I had to read it. The Butterfly and the Violin is a debut novel by author Kristy Cambron. The description intrigued me. The historical plot line tells the story of Adele. It is this plot line that I couldn’t wait to read. A young girl decides to help Jews, gets caught, and lives in a concentration camp. So far, the plot has been done in a number of novels. However, Cambron includes an interesting twist – Adele is forced to play in a concentration camp orchestra. I had no idea that such things existed and was fascinated to read all about it! The modern story felt a bit forced, but the WWII story was fantastic. It really was haunting. I have to admit that I cried near the end of the book. I also thought Cambron has a beautiful writing style and can’t wait to read her future novels. In fact, I just found out Cambron has a new book coming out in 2015 titled A Sparrow in Terezin! I definitely plan to read it! Much thanks to Thomas Nelson and BookLook Bloggers for a free copy in exchange for my honest thoughts. Have you read any of Dee Henderon’s novels? Bethany House gave me the opportunity to read and review one of her latest books, titled Undetected. From the back cover: Gina Gray would love to be married. She has always envisioned her life that way. A breakup she didn’t see coming, though, has her focusing all her attention on what she does best–ocean science research. She’s on the cusp of a major breakthrough, and she needs Mark Bishop’s perspective and help. Because what she told the Navy she’s figured out is only the beginning. If she’s right, submarine warfare is about to enter a new and dangerous chapter. 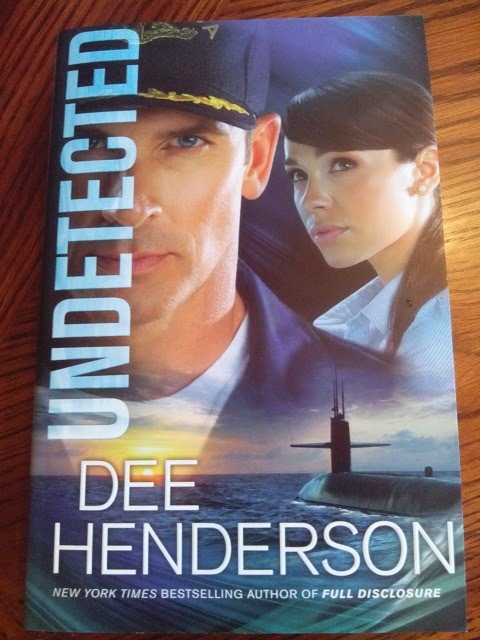 What I expected: A classic Dee Henderson novel with strong characters, a fast-paced plot, and the opportunity to learn something about ocean science research. What I found: Fairly perfect characters with few flaws, a slow moving plot, and a ton of information about ocean science research. I love reading Henderson’s early books about the O’Malley family. That series is about a family of cops, paramedics, firefighters, etc. The stories are very fast-paced as the characters face life-threatening situations while going about their jobs. The last couple of Henderson books I’ve read have been more character driven than plot driven. I miss the earlier stories, even as I recognize the strong writing that characterizes all of her novels. I love listening to people. A book is someone taking time to develop a thought – create a hypothesis, present evidence, argue a point, draw a conclusion, make their case. Some do it primarily in mathematics, others in lecture format, while others present ideas and build reasons for their conclusion. Books are enjoyable hours of listening to experts on various subjects. I might not agree with everything, but that’s a minor point to why I read what they’ve written. I like the fact they make me think (213). I especially loved this line – “Books are enjoyable hours of listening to experts on various subjects.” Yes! Books are enjoyable hours of listening! If you like Dee Henderson or are interested in oceanography, this is an interesting read. Much thanks to Bethany House for a free copy of the book in exchange for my honest opinion. Note – there is an Amazon affiliate link in this review. If you buy anything from Amazon after clicking on the link, all proceeds support our adoption. Thanks! I am the type of person who finishes almost every single book I start. I’ve given myself permission over the past year or so to not force myself to finish reading books that I don’t like. Unfortunately for Barbour Publishing, Woman of Courage is a book that I just could not finish. Woman of Courage is Wanda E. Brunstetter’s newest novel. The premise is interesting. A Quaker woman decides that she is going to move to the Wild, Wild West to minister to the Nez Perce Indians. On her trip out west, everything goes wrong. Will she reach the mission outpost and begin her ministry or will she find a ministry in witnessing to a “trapper and his intriguing half-Indian friend [who] want nothing to do with Christians” (back cover). I tried to like it. Truly I did. Maybe there is a fantastic story here but I could not get past the writing style. The final sentences in each chapter drove me crazy and often made me roll my eyes. “As clearly as the full moon beamed through the parlor window, she knew she would never fall in love again” (prologue). “If he didn’t get help soon, she could die” (chapter 7). “Did she dare ask?” (chapter 10). “Amanda hoped that was the case, because there was no way she could help Mary deliver her baby!” (chapter 13). “What was more, it was a comfort to have Thunder along, because Jim knew the dog would alert him to any danger that might be out there, lurking, because in the wilderness most anything could happen” (pg 159). Brunstetter’s book has another of my pet peeves, which is to use the title of the book several times in the story itself. I won’t quote any of the lines because they could be considered spoilers, but nothing yanks me out of a story as fast as running across the title in the dialog. I’m not sure that I would label this a “bad book” but it’s definitely not to my taste. Hopefully someone else can enjoy it! Many thanks to Barbour Publishing and Handlebar for a copy of this book in exchange for my honest opinions. All thoughts are my own! Just 18 Summers is the next review book in my stack. I read this entire book while sitting in the Chicago airport, waiting for a huge storm to blow over so that I could fly home to Seattle. It definitely filled the time well and helped me to forget that my flight was delayed several hours. From the Amazon description: After the tragic death of Butch Browning’s wife, Jenny, four families begin to realize how precious—and fleeting—their time together is. Each is at a different stage in life: Butch is facing single parenthood. The O’Reillys are expecting their first child. The Andersons are approaching an empty nest, and the Buckleys are so focused on providing their children with everything that they’ve forgotten what they truly need. With just eighteen summers before their children are grown, how do they make the most of that time when life so often gets in the way? I laughed. I cried. I rolled my eyes. I completely blocked out all the chaos of the busy airport and soaked up a story about love and family and regret and redemption. This book reminded me of the importance of holding my daughter close, of treasuring each day with her and loving her to the best of my abilities. I pray for her daily, that God will keep her safe until we can travel to bring her home. The parents in this book had 18 summers to love their children. I will have much less, as my future daughter is already 11 years old. But I hope to pack an incredible amount of love into the years we do have together. Thank you so much to Tyndale Fiction for the opportunity to read and review this book. All opinions are my own. Next up on my stack of review books is For Such a Time by the new author Kate Breslin. This story is a loose WWII retelling of the story of Esther. By “loose,” it is the story of a people who are threatened by a man who hates the Jewish race and a girl who hides her Jewishness and tries to save her people from annihilation. At the beginning of each chapter was a verse from the book of Esther. That verse summed up the events in the upcoming chapter. I wish that the verses had not been left in the manuscript. It jerked me out of the narrative each time. Being told what events from Esther are coming up in the story left little room for surprises. My favorite aspect of this novel was the actual writing itself. Breslin has a great command of English and uses words to describe the setting in such a way that you feel like you are sitting in the room, watching the action. Overall, it was a well-written book with a modern day take on Esther. It didn’t quite meet my expectations, but most people seemed to really it. If you like the story of Esther and WWII novels, I would borrow it from the library and then buy it if you will read it more than once. Thank you to Bethany House for providing a free copy of the book in exchange for my honest opinions. Being out of town and then flooded with adoption progress and trying to catch up with housework made me fall behind with my book reviews. I have been reading! I just haven’t had time to write and post reviews. This week I hope to catch up on my book reviews. 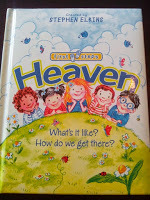 One of my recent reads was a book titled Heaven, by Stephen Elkins. 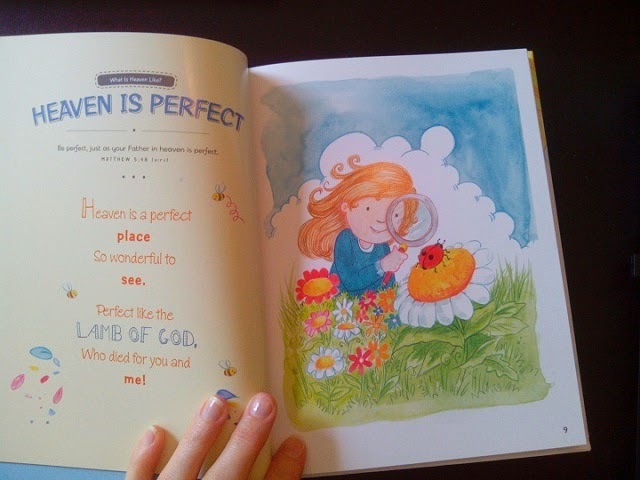 This is classified as First Steps, one written to help introduce a Bible topic to a young child. 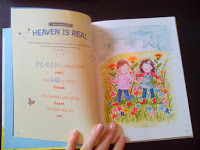 I requested it for review because I hoped that it would be a good one to teach an adopted child about Christian topics. 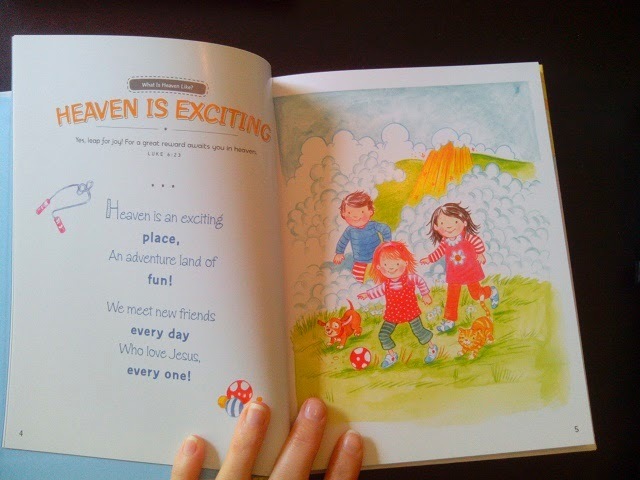 Being a First Steps book, I hoped that the idea of Heaven would be explained simply – both in simple English and simple concepts. 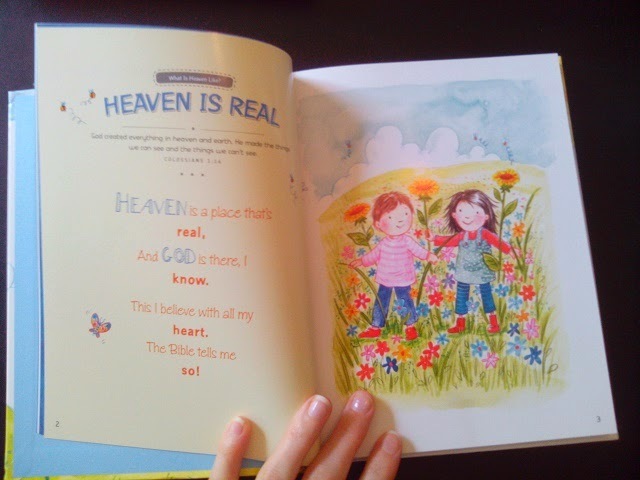 The book tackles the topic of heaven in two parts – what is heaven like? And how do we get there? It presents a beautiful picture of heaven, making it very appealing. The book goes way beyond the idea that heaven is a place to sit on a harp and sing and for that I am grateful! It also presents the idea of salvation in a factual but not overly detailed way, talking about how Adam sinned by disobeying God, that Jesus came to earth and lived a perfect life, and then died on the cross. The book does not talk about why death is required to redeem us from sin, only that it was. My first requirement for this book was fulfilled, that the idea of God, sin, salvation, and heaven are presented in simple, broken-down concepts. However, Heaven does not use the simplest of English. I have a feeling my daughter will struggle for awhile with the words in this book. A blessing the Savior imparts. With peace that does astound us. Impart. Astound. Not words you teach an English learner for awhile! Still, it’s a beautiful book and I’m glad I requested it. I look forward to reading it with my daughter and talking about God and heaven. Thank you to Tyndale House for a free copy in exchange for my honest thoughts!